U.S. envoy Richard Holbrooke visited Pakistani refugees who have fled fighting in the Swat region between their country's military and Taliban guerrillas. Ambassador Holbrooke told refugees that the U.S. can't offer security, but it can offer them aid. A new report by the International Crisis Group , a Ploughshares grantee, said the Pakistani government must be prepared to help refugees by devising a blueprint for reconstruction and prioritizing police training in the region. 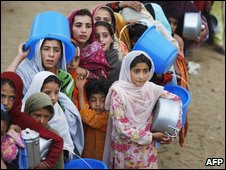 The think tank also said the international community should encourage Pakistan to stop fighting long enough so that aid can reach civilians still trapped in the battle zone.